In case you missed it amid all the big E3 announcements, Ubisoft turns 30 and as part of their celebration they invite you to rediscover their legacy in gaming by offering you seven digital PC games for free via The Ubisoft Club website. Every month from June to December a new game will be revealed and made free to download. 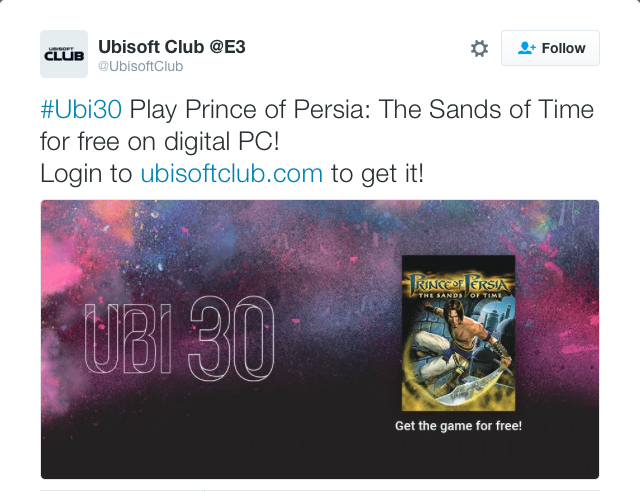 The first game is Prince of Persia: The Sands of Time and it is already available to download. All you need in order to claim these games is to register with a free Uplay account. Once you claim a game you can access it through the Uplay PC games library to download and start playing. The next game will be announced around mid July.